Done with finishing touches for three open kitchen shelves this morning. Made of red oak (on one of the photos), they were originally planned to be finished with a varnish to show off the grain, but I eventually painted them with oil-based white enamel to “match the cabinets”. The brackets are 11-1/2” by 11-1/2” and connected to the frame with loose tenons. Each shelf is 3/4” thick x 41” wide x 12-1/2” deep and is a glue-up of two narrower boards. A No.4 Bailey with a couple of winding sticks turned out to work great for flattening the glue-ups. For the finish, I put two coats of white shellac-based BIN primer, then sanded almost everything off, coated with the primer again, scuffed the surface, brushed on two coats of white enamel with sanding/scuffing in between. Sanding all the details was the longest step in the finishing process and quite a chore. I used 1-1/2” x 1-1/2” aluminum angles screwed to the wall studs (seen in one of the photos) as a backbone for the shelves. 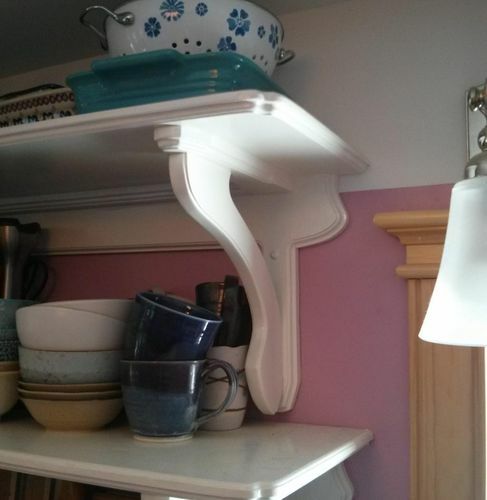 The lights will go underneath the bottom shelf. The distance between the brackets is 33”, which, theoretically, means no visible sagging for oak even for a 100 lb. load in the center. Well, glad I am finally done with this project. Oak was a great wood to work with. Next time will try to use wood filler to close the pores more efficiently. Very nicely done, Harum, looks nice and solid with a flair for style. Work Safely and have Fun. Grandpa Len. Thanks Len! 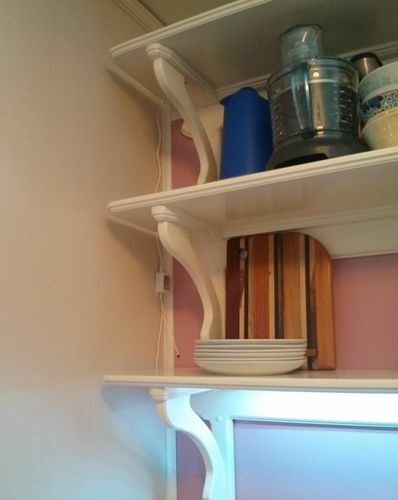 Open shelves seem like a reasonable substitution for a cabinet or two in the kitchen around the windows: the same or even more storage space without the bulkiness of cabinets. Added recently decorative “ears” to the shelves to finish the original plan. The oil-base high gloss paint holds really well: doesn’t stick, washes well. ...for those ‘go – to’ items that see use nearly every day, shelves make more sense than stacking, nesting and digging through a cupboard. Your solution is handsome and handy.